Congress leaders Ashok Gehlot and Ghulam Nabi Azad pay tribute to former Prime Minister Vajpayee at his residence in Delhi. Lights of Chhatrapati Shivaji Maharaj Terminal railway station (CMST) to remain off today as a mark of respect for the departed soul of former PM Vajpayee. Senior Congress leader Sonia Gandhi pays tribute to former Prime Minister Vajpayee at his residence in Delhi. Chennai: Students attend a candlelight vigil to pay tribute to former Prime Minister Atal Bihari Vajpayee in Chennai, on Thursday, Aug. 16, 2018. Former President Pranab Mukherjee pays tribute to former Prime Minister Atal Bihari Vajpayee. Congress President Rahul Gandhi's interaction with University professors across the nation, scheduled for August 18 in Delhi, was postponed after the demise of former PM Vajpayee. President Ram Nath Kovind pays tribute to former Prime Minister Atal Bihari Vajpayee at the latter's residence in Delhi. Senior BJP Leaders LK Advani and Murali Manohar Joshi pay tribute to former Prime Minister Atal Bihari Vajpayee at his residence in Delhi. Home Minister Rajnath Singh and EAM Sushma Swaraj pay tribute to former prime minister #AtalBihariVajpayee at his residence in Delhi. Prime Minister Narendra Modi pays tribute to former Prime Minister Atal Bihari Vajpayee at the latter's residence in Delhi. We are all deeply grieved by the sad demise of Vajpayee ji. He was one of the tallest leaders in India. He was loved by the whole nation. May his soul rest in peace: Naveen Patnaik. Former Prime Minister Atal Bihari Vajpayee's mortal remains wrapped in tricolor at his Delhi residence. Maharashtra Chief Minister Devendra Fadnavis today expressed his feelings over the death of Vajpayee. "Atal Bihari Vajpayee was a tall statesman and an inspiration to millions whose leadership and humanitarian aspects will remain eternally etched in the mind and heart of the people." West Bengal CM Mamata Banerjee arrives at former prime minister # AtalBihariVajpayee's residence, where his mortal remains are kept. Odisha government has announced government holidays tomorrow in the state; all government offices, schools and colleges to stay shut across the state. Addressing the media outside late Atal Bihari Vajpayee's residence, BJP chief Amit Shah said that Indian politics' northern star is lost forever. The funeral will be held at Smriti Sthal. Half day holiday in the afternoon of the funeral in all central government offices and CPSUs across the country as well as Delhi government offices. Former Prime Minister Atal Bihari Vajpayee's mortal remains have reached his Delhi residence at Krishna Menon Marg. Top leaders, including prime minister Narrendra Modi and BJP chief Amit Shah, have reached Vajpayee's residence to pay last respect. The body will be taken to BJP's Dehi headquarters tomorrow morning. All Punjab Offices / Boards / Corporation and Educational Institutions of the State will remain closed tomorrow as a mark of respect. Jharkhand government has declared seven-day mourning in memory of Atal Bihari Vajpayee, the state govt has also declared a state holiday tomorrow. Convoy with the mortal remains of Atal Bihari Vajpayee leaves from AIIMS (All India Institutes of Medical Sciences). The mortal remains are being taken to his residence. State mourning for seven days until 22 August. State Funeral for Vajpayee at Smriti Sthal, New Delhi. Half day holiday in the afternoon of funeral in all central government offices and CPSUs across the country, and Delhi government offices in NCT of Delhi. National Flag to fly at half mast throughout India and Indian missions abroad until 22 August. Civil Aviation Minister Suresh Prabhu has cut short his official visit to Uzbekistan, to return to India and offer his final respects to former PM Atal Bihari Vajpayee. Uttar Pradesh has also declared holiday on 17th August. All schools, colleges and offices will remain closed, Uttar Pardesh's chief minister Yogi Adityanath has said. The government has announced a 7-day mourning from 16th August to 22nd August after Atal Bihari Vajpayee's death. The flag will fly half mast and the former prime minister will be accorded a state funeral. All of us who knew Mr. Atal Bihari Vajpayee are saddened to hear about his passing away. He was a great leader with a sense of compassion and humor. He will be remembered fondly by a vast number of us. HD Devegowda – With the demise of Former Prime Minister Atal Behari Vajpayee the country has lost a stateman and politician who believed in different cultures of the country. He was a true parliamentarian, with his death as a vacuum, was created in politics and end of an era of politics in this country. He was a great speaker, who personally refused to attack his political opponent. He did not allow the house to be disturbed during my tenure as Prime Minister for the 11 months. He is one of the highest political leaders the country has seen. He was curt in asking the Chief Minister of Gujart to follow Raja Dharma. Chief Minister H.D.Kumaraswamy has expressed his deep grief on the demise of former Prime Minister of India, Atal Bihari Vajpayee. Shri Vajpayee was a great visionary who believed that Highways are like the lines on the palm that speak about the future. He was a rare breed of politicians who lived the values ​​they believed, he said in his Message. "Will not accept the defeat, will never be afraid of new challenges" a line from his poem was the mirror to his personality. He believed in brotherhood and harmony and tried to bind the country with Golden quadrangle. He was a great speaker and a parliamentarian, he described. His death has created a vacuum in the political circle of the country, he said in his condolence message. The BJP's national executive meeting scheduled to be held on August 118 and 19 has been canceled. The mortal remains of former prime minsiter Atal Bihari Vajpayee will reach his Delhi residence at 7 pm. His last rites will be performed at Vijay Ghat at 5 pm tomorrow. Atal Bihari Vajpayee likely to be cremated on the banks of river Yamuna tomorrow. Urban Development ministry has allocated about 1.5 acres of land at Vijay Ghat, which has already been inspected by the MCD commissioner. Land will be developed as a memorial for late PM Vajpayee. BJP leader LK Advani has expressed deep shock over the demise of former Prime Minister Atal Bihari Vajpayee, calling him "one of India's tallest statesmen." Advani said that he had long association with Vajpayee since their days as Pracharaks of RSS and later during the formation of BJP in 1980.0. "Atuli will be remembered as the pioneer of the first ever non-Congress coalition government at the Center and I had the privilege of working as his deputy for six years." An emergency cabinet meeting will be held to decide the modalities of mourning over the demise of Vajpayee. Former Pakistani President General Parvez Musharaf expresses condolence over Atal Bihari Vajpayee's death and remembered him as a gentleman and a revolutionary. He also said that Vajpayee's Agra summit was realistic and was disappointed when the resolution was not signed. The Congress said, "former PM Atal Bihari Vajpayee was a great leader, loved by many & revered by all. We grieve his demise and our thoughts & prayers are with his family today. Deeply saddened at the passing away of Shri Atal Bihari Vajpayee. A reasoned critique in opposition and a seeker of consensus as PM, Atal Ji was a democrat to the core. In his passing away, India has lost a great son and an era has come to an end. My deepest condolences says former president of India, Pranab Mukherjee. President of India Ram Nath Kovind in his condolence message said, "very sad to hear about the passing of Atal Bihari Vajpayee, our former prime minister and a true Indian statesman. His leadership, foresight, maturity and eloquence put him in a league of his own. Atalji, the Gentle Giant, will be missed by one and all. Prime Minister Narendra Modi said, "I have no words, I'm filled with emotions right now. Our respected Atal ji is no more. Every moment of his life he had dedicated himself to the nation. " Former Prime Minister Atal Bihari Vajpayee passed away at 5.05 pm today. Atal Bihari Vajpayee dies at 93. Madhya Pradesh Congressman Jyotiraditya Scindia has canceled his Guna tour in view of the former prime minister Atal Bihari Vajpayee's critical health. He will be flying to Delhi from Bhopal in the evening. Madhya Pradesh CM Shivraj Singh Chouhan arrives at AIIMS (All India Institute of Medical Sciences) where former PM Atal Bihari Vaajpayee is admitted. West Bengal chief minister Mamata Banerjee has arrived in Delhi to visit Vajpayee. DMK's acting president M.K.Stalin will be arriving in Delhi to visit Atal Bihari Vajpayee in AIIMS. Chhattisgarh and the whole nation are praying for him. We pray to the God to make him healthy soon & bless him with a long life: Chhattisgarh CM Raman Singh. Bihar chief minister Nitish Kumar and deputy chief minister Sushil Modi have also reached Delhi's AIIMS. Congressional General Secretary Ashok Gehlot and Uttar Pradesh Congress Committee Chairman Raj Babbar at the premier institute where Vajpayee is on life support. RSS chief leaves for New Delhi. He will visit AIIMS today. Union Health Minister JP Nadda has said that the hospital will release its routine health bulletin soon. Congress President Rahul Gandhi arrives at AIIMS (All India Institute of Medical Sciences) where former PM #AtalBihariVaajpayee is admitted. He is a life support system. As former prime minister Atal Bihari Vajpayee continues to battle for life at the All India Institute of Medical Sciences in New Delhi, people of all faiths in his "karam bhoomi "Lucknow held special prayers for his long life. According to sources, Shiv Sena chief Uddhav Thackeray has left for Delhi and will meet Vajpayee at AIIMS. A string of political leaders have visited the Delhi hospital to inquire about the health of the former prime minister. Union Minister Dharmendra Pradhan and Jitendra Singh & BJP Leader Bhuepnder Yadav outside the residence of former PM #AtalBihariVaajpayee. He is a life support system at AIIMS (All India Institute of Medical Sciences). Prime Minister Narendra Modi will arrive at AIIMS shortly. The PM had visited Vajpayee yesterday too. Special prayers for former PM Atal Bihari Vajpayee at Sakteshwar Mahadev Ashram in Ludhiana. Youth Congress Leader Shakir Khan offers 'chadar' at a dargah in Gwalior, praying for Atal Bihari Vajpayee. Union ministers Ram Vilas Paswan and Uma Bharti also visited AIIMS hospital in Delhi to inquire about Vajpayee's health. Special prayers are being offered for Vajpayee's recovery at the Hanuman Mandir in Delhi's Connaught Place. Rajasthan Chief Minister Vasundhara Raje has suspended her pre-poll campaign in her state and has left for Delhi to meet ailing former Prime Minister Atal Bihari Vajpayee. Arvind Kejriwal came out at his residence to meet supporters and urged them not to celebrate his birthday this year owing to Atal Bihari Vajpayee's critical health and Kerala Floods. He also urged them to donate generously to help those in need in Kerala. All roads to AIIMS blocked. Entry of private vehicles restricted as Vajpayee continues to remain in critical condition. SPG commandos leave for Vajpayee's residence. Another medical bulletin soon. The Karnataka BJP leadership is also heading from Bengaluru to Delhi, including Union Minister Sadananda Gowda. Former Karnataka CM and state BJP President BS Yeddyurappa has suspended all meetings and scheduled plans in view of Atal Bihari Vajpayee's sensitive health. Bihar chief minister Nitish Kumar expressed his concern over Atal Bihari Vajpayee's deteriorating health condition. "I am praying to God for his recovery," he said in a statement. Uma Bharti has said that she is worried about Atal Bihari Vajpayee's deteriorating health condition. She said that Vajpayee created the Bharatiya Janata Party and nurtured it. UP Chief Minister Yogi Adityanath to cut short his Gorakhpur visit and fly to Delhi to see Atal Bihari Vajpayee. Also expected are Bihar CM Nitish Kumar and Rajasthan CM Vasundhara Raje. Deputy CM of Karnataka Dr. G Parameshwara prays for Atal Bihari Vajpayee's speedy recovery. "I am deeply saddened to hear that his health is in bad condition," Parameshwara said. BJP leaders Anurag Thakur and Rajiv Pratap Rudy also reached AIIMS to visit Atal Bihari Vajpayee. Congress chief Rahul Gandhi has reached AIIMS to meet former Prime Minister Atal Bihari Vajpayee. Madhya Pradesh Chief Minister Shivraj Singh Chouhan will fly to Delhi today to meet Atal Bihari Vajpayee. CM Chouhan has postponed his election campaign to pay a visit to the BJP stalwart who is being treated at AIIMS. Maharashtra Chief Minister Devendra Fadnavis will leave for Delhi from Nagpur at 3 pm today. Bihar Chief Minister Nitish Kumar will also reach AIIMS to meet Atal Bihari Vajpayee. The latest medical bulletin says former PM, Atal Bihari Vajpayee's condition continues to remain the same. He is critical and is on life support, the AIIMS bulletin also said. External Affairs Minister Sushma Swaraj reaches all India Institute of Medical Sciences where former Prime Minister Atal Bihari Vajpayee is admitted. Heavy security deployed at the hospital ahead of PM's arrival. AIIMS will release a medical bulletin on Vajpayee's health shortly. The previous bulletin had said that the leader was critical and had been put on life support. Union Home Minister Rajnath Singh has arrived at the AIIMS where Atal Bihari Vajpayee has been admitted. Earlier Prime Minister Narendra Modi, Vice President Venkaiah Naidu among others too had called on the iconic BJP leader. The whole nation is praying for the recovery of Atal Bihari Vajpayee. The condition of Vajpayee remains critical and he continues to be on life support. Congress President Rahul Gandhi to visit AIIMS where former Prime Minister Atal Bihari Vajpayee is admitted. West Bengal Chief Minister Mamata Banerjee to travel to Delhi later today, will visit AIIMS where former Prime Minister Atal Bihari Vajpayee is admitted. BJP President Amit Shah arrives at All India Institute of Medical Sciences (AIIMS) where former Prime Minister Atal Bihari Vajpayee is admitted. Prime Minister Narendra Modi, Union Minister Smriti Irani, Piyush Goyal visited AIIMS to enquire about the health condition of former Prime Minister Atal Bihari Vajpayee. Former Prime Minister Atal Bihari Vajpayee is under the supervision of Dr. Randeep Guleria, a pulmonologist and is currently the director of AIIMS. Dr Guleria has served as personal physician to Vajpayee for over three decades. A team of doctors from the nephrology, gastroenterology, pulmonology and cardiology departments is keeping around the clock check on the leader. PM Modi reached the hospital at around 7.15 pm and spent about 50 minutes there.This is PM Modi's fourth visit to Vajpayee since he was admitted to AIIMS on July 11. Union Minister Ashwini Kumar Choubey visits All India Institute of Medical Sciences (AIIMS). BJP chief Amit Shah, RSS chief Mohan Bhagwat, former prime ministers Manmohan Singh and HD Deve Gowda, Congress president Rahul Gandhi, Vice President Venkaiah Naidu and several chief ministers and union ministers have visited Vajpayee at the AIIMS over the past 11 days. 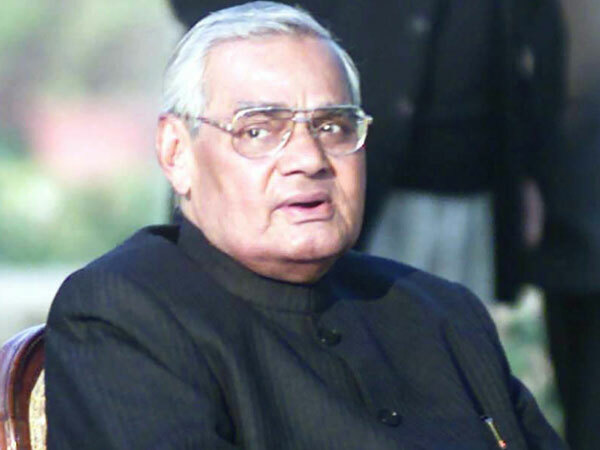 Vajpayee was admitted to the All India Institute of Medical Sciences (AIIMS) on June 11 with kidney tract infection, chest congestion, urinary tract infection and low urine output.